Jay Key's How to Pick Up Women with a Drunk Space Ninja is a hilarious novel which falls into the buddy-cop genre. However, in this instance, the "buddy" is a Japanese-Irish space ninja named Ishiro'shea and the "cop" is a bounty hunter named Duke LaGrange. This is book one of The Adventures of Duke La Grange and in this installment, readers begin their journey with Duke hanging around Cyber Joe's Grill & Go. Cyber Joe's is run by Queen Joe, a mysterious being who is able to control portals that lead from one place to another... except for one. Queen Joe enlists Duke to help figure out why the portal has appeared in her bar. This is where things truly set off. Prepare for action, adventure, and outer space! 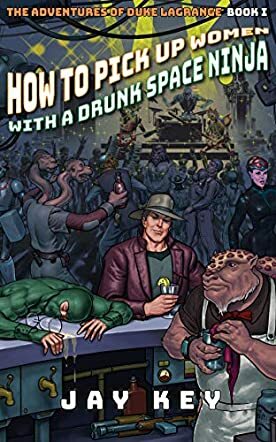 I am an avid reader and a huge fan of books with a flair for humor, and without a doubt, How to Pick Up Women with a Drunk Space Ninja stands out. The humor made me burst out laughing at times. I know on the surface that Duke LaGrange may seem like a power fantasy for a specific male audience, but anyone turned away by that is going to miss out on Key's witty, fast-paced, and imaginative style of writing. Comedy is one of the most challenging genres for authors to write because of how subjective it is - humor can be a hit or a miss - but in Key's case, he hits a home run with his first installment of The Adventures of Duke LaGrange. I recommend this novel to anyone feeling the urge or the need to go on a stellar trip out the mundane.